Nobody should worry that remembering the persecuted over this busy and joyful Christmas - New Year season might cause joy to be subsumed in sorrow or anxiety. It is with a spirit of brotherly and sisterly love that we remember and lift up the persecuted at this time, confident that such prayers will bring comfort and encouragement to our brethren and will please the Lord who is 'Father' to us all. Almighty God and gracious Father -- in you alone do we trust. For you alone are worthy, being supreme in power, authority, wisdom and understanding, glorious in majesty and perfect in love. The whole Body of Christ rejoices in your incarnation, that selfless act of unsurpassed humility through which you came and dwelt among us -- to live the life we could not live and die the death we should have died -- to redeem us for yourself. For this, the greatest gift born of the greatest love, we thank you. Grant us, Lord, in your mercy and grace, a fresh outpouring of your Holy Spirit to embolden us in our witness, work in us righteousness, encourage us on our path to the cross, sustain us in our trials, empower our testimony and bind us together. May those who are persecuted be palpably aware of the Spirit's eternal presence, Christ's sustaining love, and the Father's unsurpassed power and resolute faithfulness. Lord, we beseech you: fight for them, shield them, carry them and deliver them. To this end, we offer ourselves as your servants. And may all who see this recognise that Jesus Christ is Lord. NEWS: This will be the last Religious Liberty Prayer Bulletin (RLPB) for 2016. While an urgent prayer alert or request will be issued should the need arise, the next formal RLPB will be the January Update on 25 January 2017. UPDATES: Please do not be daunted by this non-exhaustive list. Feel free to just pick one nation, one situation or one person either from this list or beyond it and pray through this Christmas season as you feel led. Seek the Lord in this, and trust him to have everything and everyone covered. NOTE: the high risk season includes Advent, Roman Catholic and Protestant Christmas (24-25 December), New Year, Greek Catholic and Eastern Orthodox Christmas (6-7 January). Last week we prayed concerning the 11 December Advent massacre in Cairo's St Peter and St Paul church, noting the elevated terror threat over the Christmas - New Year season. The terror threat is extreme in Egypt, Syria (particularly in western Aleppo and Damascus), Pakistan and Nigeria and high in Kenya, Indonesia and Europe. [See: RLPB 388 (14 Dec).] The updates below confirm this assessment. EGYPT: The SITE Intelligence Group has provided a more accurate translation of the claim of Islamic State (IS) of responsibility for the Cairo church bombing. 'Let all the disbelievers and apostates in Egypt and everywhere know that our war on polytheism is ongoing, and that the State of the Caliphate -- with permission from Allah the Almighty -- will continue to spill their blood and grill their bodies, so that there is no sedition and the religion is all for Allah.' 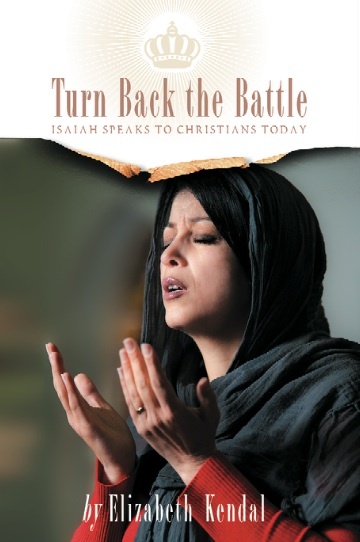 Because Islam views Trinitarian Christianity as polytheism, we can be sure that IS will be at war against Christianity until 'the religion is all for Allah'. SYRIA: On Friday 16 December Islamic militants strapped an explosive belt to an 8-year-old girl and sent her into a police station in the Al-Midan neighbourhood of Damascus, before detonating the explosives remotely. The girl was the only fatality. The terror threat in Syria is extreme. GERMANY: On 16 December police arrested a 12-year-old boy accused of twice attempting to detonate a home-made, nail-filled, Improvised Explosive Device in his home town of Ludwigshafen, western Germany. On 30 November the boy, who was born in Germany to Muslim Iraqi immigrant parents, tried to bomb a Christmas market. Then on 2 December he left a bomb outside a high-rise complex comprising City Hall and a shopping mall. Fortunately, both bombs failed to detonate. 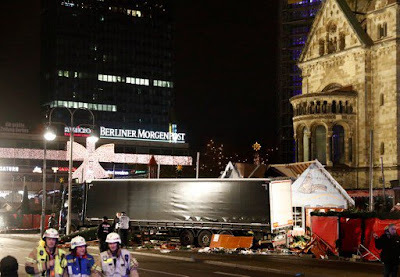 However, on the evening of 19 December, 12 died and some 50 were wounded when a presumed Islamic terrorist drove a 7-tonne truck at high speed into one of Berlin's largest Christmas night-markets, the Breitscheidplatz Christmas market, beside the Kaiser Wilhelm Memorial Church. Kaiser Wilhelm ruled Germany from 1888 to 1918. An ardent Islamophile (lover of Islam), he maintained close ties to the Ottoman Sultan / Caliph and believed Germany's future lay in a strategic alliance with Islam. INDONESIA: The blasphemy trial of Jakarta's ethnic Chinese Christian Governor Basuki 'Ahok' Tjahaja Purnama [RLPB 383 (9 Nov)] commenced on 13 December. Ethnic and religious tensions are soaring. On 14 December the Indonesian Ulema Council (MUI) issued a fatwa (religious ruling) forbidding Muslims from participating in Christmas festivities, particularly the wearing of Christmas-themed accessories. The Islamic Defenders Front (FPI) has been out in force, visiting shopping malls and spreading the word as police watch on, refusing to intervene. The police also failed to intervene on 6 December to stop the Ahlus Sunnah Defenders (PAS) from forcing the closure of a Carol Service in Bandung, West Java, even though all permit requirements to hold the service had been fulfilled. Without police support, pastor Stephen Tong had little choice but to comply, so the congregation closed with one hymn and a prayer and went home. RUSSIA: It was indeed an oversight to have left Russia off the list of places where churches face an elevated terror threat over Christmas - New Year. [It was included last year, RLPB 228 (1 Dec 2015).] On 19 December Andrei Karlov (62), a career diplomat and Russia's Ambassador to Turkey, was assassinated while speaking at an art exhibition in Ankara. The assassin (now dead) was a policeman. After shooting the Ambassador he shouted 'Allahu akbar' and (in Arabic), 'We are the descendants of those who supported the Prophet Muhammad, for jihad,' and (in Turkish), 'Don't forget Aleppo, don't forget Syria!' This appalling assassination is a reminder of how much Sunni fundamentalist anger is directed at Russia. PRISONERS: A significant number of Christians will spend the Christmas season as prisoners, many in truly appalling conditions, none more so than the many thousands of believers detained in North Korea and Eritrea. Some Christians have been in prison for years, such as Asia Bibi in Pakistan, and others in Iran and Laos. Some are more recent prisoners, like those we have been praying for this year in Algeria, China, Iran, Sudan and Vietnam. They are Christian lawyers who defend human rights and religious freedom. They are Christian aid workers who serve the poor and needy. They are pastors devoted to feeding and leading Christ's flock. They are missionaries who risk their lives to 'make disciples of all nations ...' (Matthew 28:19-20a). They are converts who have chosen to follow Jesus -- no turning back. They are faithful, courageous believers and we are not to be ashamed of their chains (1Timothy 1:15-18). The newest prisoner is Rev. Andrew Brunson, the American Protestant pastor of the Dirilis (Resurrection) Church in Izmir, TURKEY. Brunson (48) and his wife Norine were arrested on 7 October, deemed a threat to national security. Norine was subsequently released, but Brunson was transferred to the Harmandanli Detention Centre where he is being held incommunicado. He faced court on 9 December accused of 'terrorism' and links with the Gulen Movement. The Erdogan government blames the Gulen Movement for July's failed coup attempt and maintains that the US was complicit. Fethullah Gulen has lived in self-imposed exile in the USA since 1999. Turkey is demanding his extradition (so maybe they wanted a bargaining chip). The Brunsons, who have three children studying in the US, have lived in Turkey for the past 23 years. Andrew Brunson's situation is dire. 'Remember those who are in prison, as though in prison with them, and those who are mistreated, since you also are in the body' (Hebrews 13:3 ESV). MISTREATED: Not to be forgotten are captives such as Dr Ken Elliot and Beatrice Stockly [RLPB 341 (27 Jan)] and Father Tom Uzhunnalil [RLPB 368 (27 July)] hostages of Islamic militants in Mali and Yemen respectively. Nor must we forget those forced into hiding in North Korea, Saudi Arabia, Somalia and other places where an expression of faith will cost believers their lives. 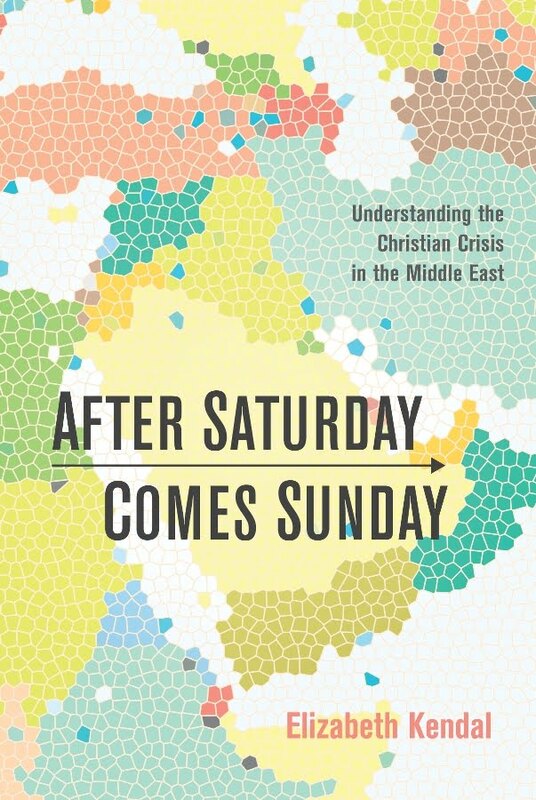 Also not to be overlooked are the millions of believers who are now displaced, homeless, destitute and grieving -- across Mesopotamia (Syria-Iraq), Burma, Nigeria, Central African Republic, Sudan, South Sudan and elsewhere. it's upper windows blown out. St Mark's Cathedral in the background. 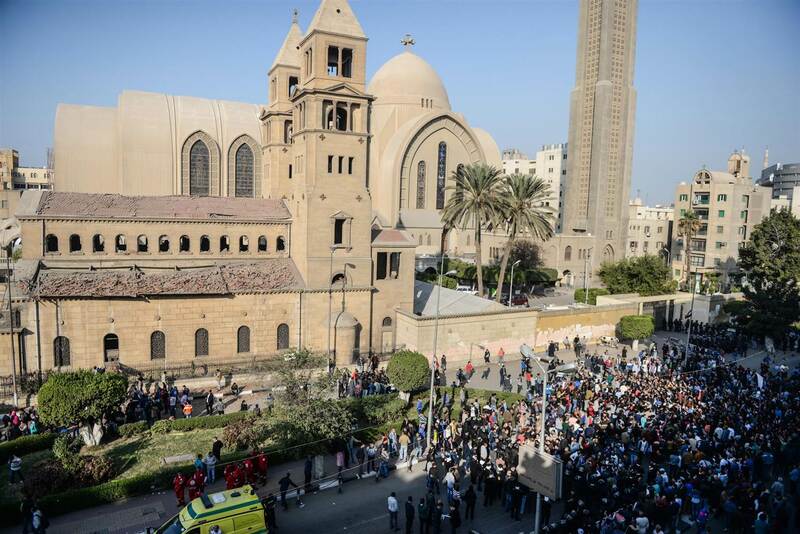 On Sunday 11 December the Egyptian Christians worshipping inside Cairo's St Peter and St Paul church (El-Botroseya) were doubtless aware of the elevated terror threat. After all, Christians have been targeted over the Christmas-New Year period before. On 7 January 2010, seven Coptic youths and one Muslim guard were gunned down as they emerged from a Christmas Eve midnight mass in Nag Hammadi. In the early hours of 1 January 2011, 23 mostly Coptic Christians were killed when an Islamic suicide terrorist detonated his explosive-laden car outside a Coptic church in Alexandria during a midnight service to welcome in the New Year. Consequently, the worshippers inside El-Botroseya last Sunday -- men seated on the left, women and children seated on the right (as is Coptic tradition) -- were doubtless grateful for the armed guards stationed at the door. Part of a large Coptic Church compound, El-Botroseya is located adjacent to St Mark's Coptic Cathedral, the most significant Cathedral in the Coptic Church, the Seat of the Coptic Orthodox Pope. Inside El-Botroseya the believers were celebrating Advent -- a time when Christians look forward to the Nativity of Jesus. As it happened, it was also 'Mawlid', the day when Muslims celebrate the birth of Muhammad. 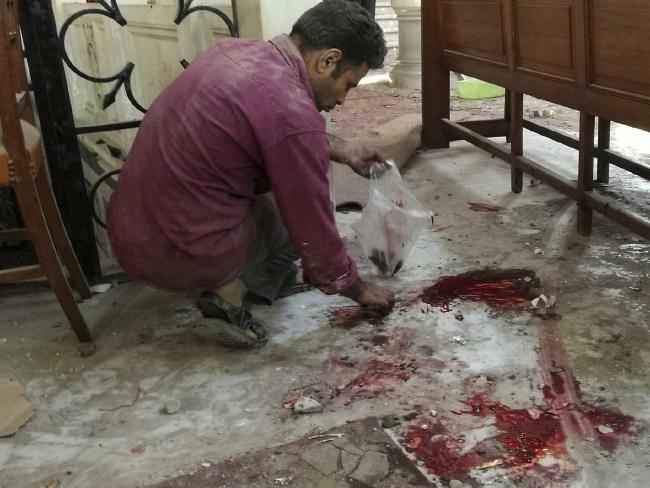 As the service drew to a close, a man reportedly entered the church and walked in amongst the women and children where he detonated an explosive vest containing 12kg of TNT. In addition to the bomber, 24 worshippers were killed -- mostly women and children, including several infants -- making it the most deadly attack on Christians in recent years. A further 49 were wounded. Instead of guarding the entrance, the security guards were reportedly sitting in their car. The next day (Monday) Egypt's President Abdel Fattah Al-Sisi named Mahmoud Shafik Mohamed Mostafa (22, also known as Abu Dajjana al-Kanani) as the bomber. Three other men and one woman have been arrested over the attack. Doubtless embarrassed by the security lapse, President Al-Sisi rushed to exploit the funeral for photo opportunities. While Church and State officials were given passes to attend the State funeral, local Copts -- including the relatives of the slain -- were kept at a distance. 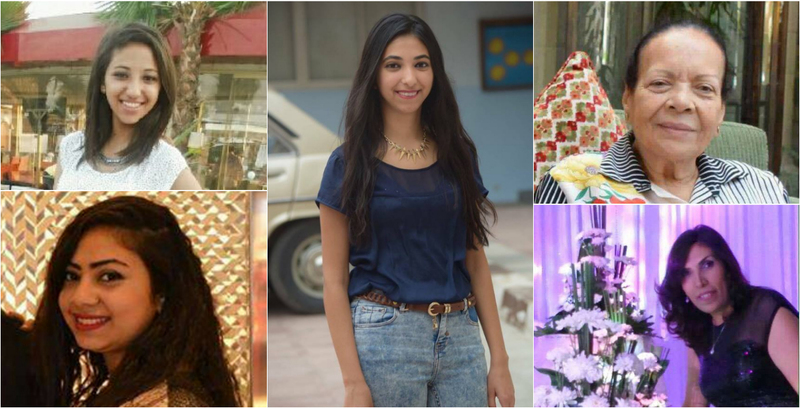 It might have made good television propaganda, but Copts told Morning Star News that the funeral left them hurt and angry. On Wed 14 Dec, Islamic State (IS) claimed responsibility for the bombing, vowing to 'continue its war against polytheism', [by which it means trinitarian Christians]. Islamic State (IS), which is primarily active in Sinai, is the inspiration behind Muslim Brotherhood-linked militant groups that have committed several attacks and attempted assassinations in Cairo over recent weeks. The threat facing Coptic Christians this Advent, New Year and Orthodox Christmas (6-7 January) is extreme. 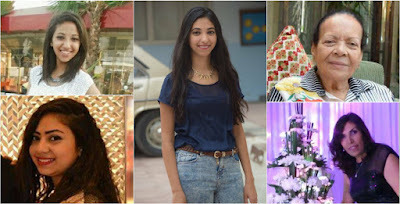 Egyptian Christians will not be the only believers facing an elevated terror threat this Christmas-New Year period. The risk will be elevated right across the Middle East, but nowhere more so than in SYRIA, where jihadist groups that are losing territory will be reverting to an angry terrorist insurgency. The liberation of eastern Aleppo might be all but over, but with tens of thousands flooding into western Aleppo [see excellent CNN report], the possibility that jihadists have infiltrated the masses means the terror threat facing western Aleppo must be regarded as extreme. Furthermore, with IS once again in control of the central oasis of Palmyra, the terror threat to Damascus, along with all the Assyrian villages located between Palmyra and Damascus, must be regarded as extreme. Likewise in PAKISTAN, where the Taliban is ascendant and doubtless keen to make a statement before winter sets in and fighting dies down. In NIGERIA, where Boko Haram (now known as 'Islamic State West Africa Province') might also want to make a statement over Christmas, the terror threat must be regarded as extreme. Other high risk zones include KENYA (which is threatened by al-Shabaab), INDONESIA (where anti-Christian Islamic zeal is boiling) and possibly even EUROPE, where popular resistance to mass Muslim immigration is gaining momentum. * 'the God and Father of our Lord Jesus Christ, the Father of mercies and God of all comfort, who comforts us in all our affliction,' (2 Corinthians 1:3-4a ESV) will infuse by his Holy Spirit deep spiritual comfort into those now grieving the loss of loved ones so cruelly slaughtered in their place of worship. * the LORD of Hosts (the commander of heaven's angelic armies) will shield and protect his people (Psalm 17:8-9) and bring the way of the wicked to ruin (Psalm 146:9). On Sunday 11 December an Islamic terrorist blew himself up amongst Christians celebrating Advent in Cairo's St Peter and St Paul church. Specifically targeting the women and children, he killed 24, making it the most deadly attack on Christians in recent years. A further 49 were wounded. With Islamic State (IS)-inspired Muslim Brotherhood-affiliated militants escalating their activity, the Christmas-New Year terror threat in Egypt must be regarded as extreme. Similarly, the terror threat is extreme in Syria (from IS and 'rebels'), Pakistan (from IS and Pakistani Taliban) and Nigeria (from Boko Haram). It is high in Kenya (from al-Shabaab), Indonesia and Europe. Pray that the Lord will shield and protect his people (Psalm 17:8-9) and bring the way of the wicked to ruin (Psalm 146:9). Amen. On 7 August 2014 China's long-disappeared, internationally acclaimed Protestant Christian human rights lawyer, Gao Zhisheng, was released from secret 'black jail' detention. Tortured and emaciated, after three years in solitary confinement, Gao struggled to string a sentence together. As was clear to this writer at the time [see RLPB 275 (27 Aug 2014)], in releasing Gao in such a state, the CCP was sending a message that 'this is what happens to those who challenge the CCP!' More than a provocative act, it was also an experiment. If the CCP could do this to the high-profile Gao Zhisheng (52) without consequences, it could do it to anyone. Likewise, the persecution of the Church in Zhejiang, in particular in Wenzhou ('China's Jerusalem'), has been an experiment. If the CCP can remove the Cross and rein in the Church across China's Christian heartland without consequences, it can do it anywhere in China. 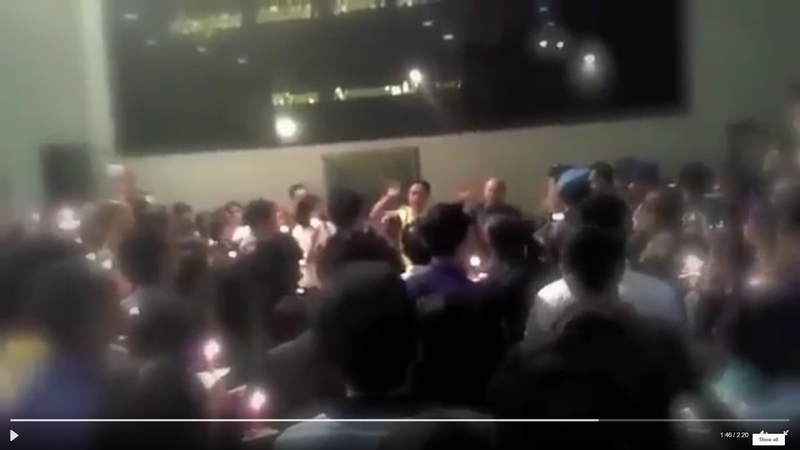 The CCP is cracking down on unregistered (illegal) house churches, while at the same time reining in the State-approved, registered 'Patriotic' churches. As reported in previous RLPBs, several leading CCP-recognised Protestants -- pastors with the CCP-approved Three Self Patriotic Movement and leaders in CCP-approved China Christian Council -- now languish in prison on serious corruption charges, simply for criticising the CCP's religious policy. Meanwhile, leading Christian human rights lawyers have also 'disappeared' into detention. On Wednesday 30 November two Chinese Catholic bishops were ordained with joint Beijing-Vatican approval, indicating that CCP-Vatican rapprochement is making headway. 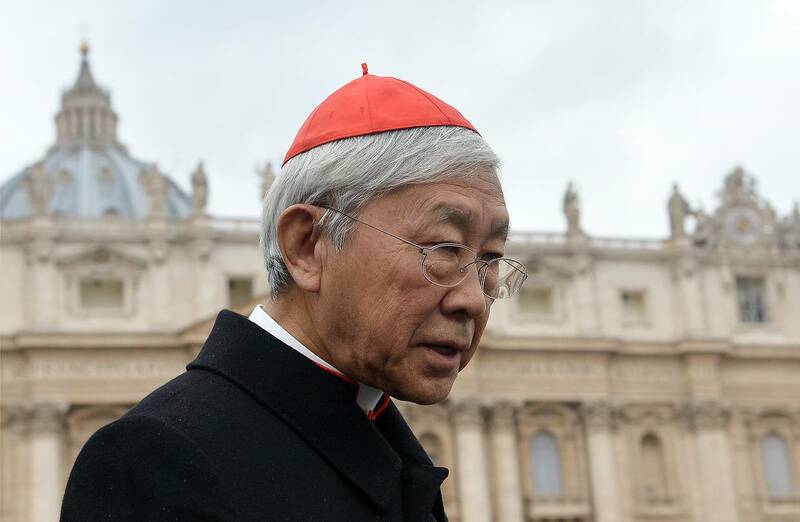 Cardinal Joseph Zen -- the former Bishop of Hong Kong and the most senior Chinese cleric in the Catholic Church -- has urged the Vatican not to go through with the 'landmark agreement' that would see the Vatican recognise only those bishops already approved by the CCP-approved Catholic Patriotic Movement. Such an agreement would necessitate the Vatican severing ties with the underground Catholic Church, which Zen notes would betray the faithful and fuel repression. There is still no word on the whereabouts of Christian human rights lawyers Zhang Kai (re-arrested on 31 August [see RLPB 377 (27 Sept)]; and Jiang Tianyong (believed to have been abducted into secret detention on 21 November) [see RLPB 386 (30 Nov)]. Furthermore, over the weekend of 26-27 November, Chinese security officers raided the Gospel Drug Treatment Church in Guangdong, which specialises in helping people with addictions free of charge, through its Christian rehabilitation centres. Many of its members are former patients whose lives have been transformed by treatment and by the Gospel. Computers and literature were seized and the church's leaders, Hong Kong residents Mr and Mrs Lin Haixin, were arrested, presumably for conducting unregistered (illegal) religious activities. Their whereabouts remain unknown. * the ever-present Spirit of God will minister to Zhang Kai, Jiang Tianyong, Mr and Mrs Lin Haixin, and all other Christian leaders and lawyers presently languishing in Chinese prisons. * the Lord will grant divine wisdom to all Christian figures and Church leaders, local and foreign, seeking to engage or negotiate with the Chinese Communist Party; may their eyes be open to reality and not be deceived; may they walk in obedient faith, trusting only in the Lord. * the Lord will continue to build his Church in China, refining her, moulding her and sanctifying her in preparation for the day of her freedom. [The Lord] executes justice for the oppressed ... The Lord sets the prisoners free; the Lord opens the eyes of the blind ... but the way of the wicked he brings to ruin (from vv 7-9). Anticipating that economic downturn will result in escalating social and political unrest, the ruling Chinese Communist Party (CCP) has been reviving ideology, bolstering its power and consolidating its control over every element of society. Confident it can commit extreme human rights abuses with impunity, the CCP will doubtless move to persecute the Church into submission nation-wide. Numerous Christian leaders are already in prison, mostly on bogus corruption charges. There is still no word on the whereabouts of Christian human rights lawyers Zhang Kai (re-arrested on 31 August) and Jiang Tianyong (abducted on 21 November). Meanwhile, Hong Kong residents Mr and Mrs Lin Haixin were arrested in late November for running an unregistered Christian rehabilitation ministry in Guangdong. Their whereabouts are unknown. Please pray for China and its Church.